The Bunnies Continue to Multiply! Spring has officially arrived and here in the Maritimes we like to celebrate with a little dusting of the white stuff once again! A light snowfall adds glitter to the colorful crocus! 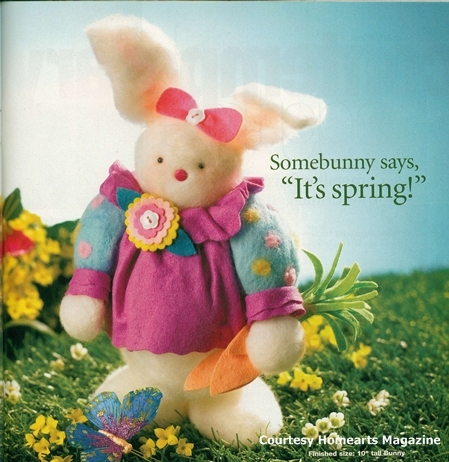 The latest issue of Homearts magazine just arrived in my mailbox, this bunny I loved making. I have to admit needle felting whimsical characters is my favorite craft! It is an easy portable craft, I have step by step instructions on my How To page! STYROFOAM TM brand foam is so easy to needle felt with. Paper craft brads are ideal for eyes and noses. If you stick an eye in the wrong place you can always move it!